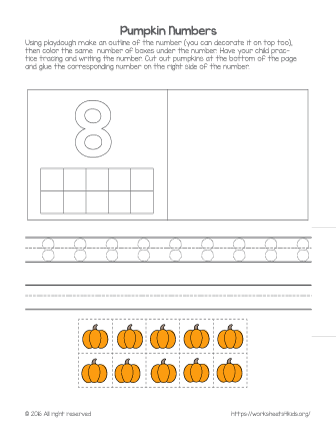 Let's bring holiday fun into your lesson and practice numbers with pumpkin. The number 8 worksheet has a lot of activities and skills to practice! Develop fine motor skills by making an outline of number 8 using playdough. Decorate it on top with small beads, rice, beans or any other material. Color the corresponding number of boxes below the number 8 and practice tracing number 8 and try to remember how this number looks.